Click on the year below to see contest updates for that period. With temperatures that dipped to 14 degrees below zero in January, it’s time to start thinking about spring with the 15thannual Meltdown. The concrete blocks sit on a wooden pallet that holds a flag. The flag is simply a marker that shows where the blocks are in the event they get completely covered in snow. The blocks are connected to an electric clock by a rope. The clock is plugged into an outlet in the gatehouse on the dam holding back Hammond Pond. Once the blocks fall through the ice or the ice floe moves away from the dam, the tension on the cord will pull the plug out of the wall socket and stop the clock. Simple, right? This year, our fundraising efforts will be directed towards the Hampshire Regional High School Musical Theatre’s ‘Scene and Heard’. The goal of this first time ever capital campaign for the group is to purchase 12 body microphones, two moving lights and special marley flooring for their theatre program. Regular updates are posted in the 2019 Meltdown Updates page of this website and on the Meltdown Facebook page. Additional tickets can also be downloaded from this site using the link above. Participants that include an e-mail address on their ticket stub will be added to a private e-mail distribution list that is used to provide periodic updates and snapshots of the block. The current list includes several hundred addresses of people who are regularly entertained by these updates. The sooner your tickets are returned, the sooner you can become part of that exclusive group. The deadline for ticket submissions is April 1st. Back in 2016, the block fell through the ice on March 11th– almost three weeks before the deadline. Tickets received after April 1st(unless they were postmarked on or before that date) will be returned. This date is weather dependent and will be irrelevant if the block falls through the ice before the deadline. The most popular dates continue to be 4/15 (724), 4/10 (700), 4/12 (698), 4/1 (678) and 4/13 (649). 83% of all guesses have been for dates between March 27th and April 26st. Click on the flags for the answers to your questions. Checks should be made payable to the Hammond Acres Club, Inc.
Where should my ticket stubs and payment be mailed? Who will benefit from the 2019 Meltdown? The Hampshire Regional High School Musical Theatre’s “Scene and Heard Campaign”. What's the deadline for submitting tickets? The deadline for ticket submissions is Monday, April 1st. Back in 2016, the block fell through the ice on March 11th– almost three weeks before the deadline. Tickets received after April 1st (unless they were postmarked on or before that date) will be returned. This date is weather dependent and will be irrelevant if the block falls through the ice before the deadline. Here is our library of videos taken over the years of the Meltdown Contest. 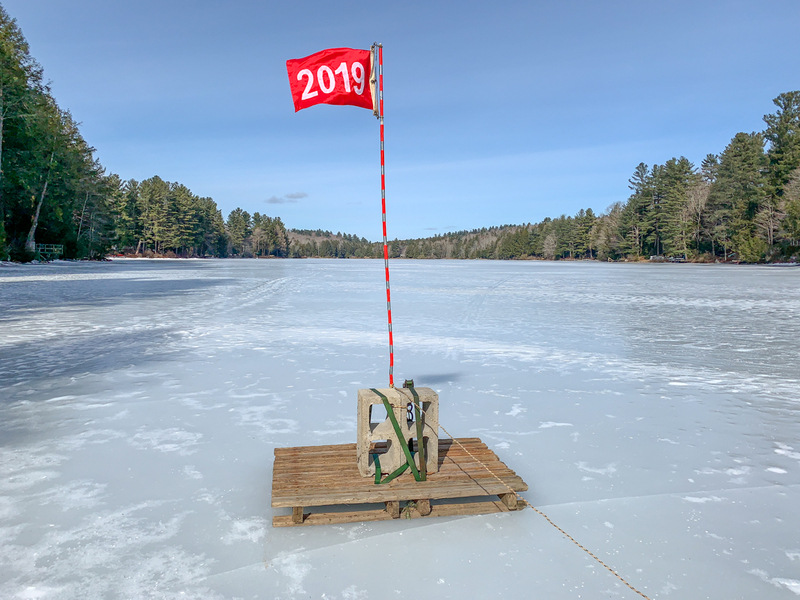 2019 – This time-lapse video captures 11 hours of activity on Saturday, April 13th from 8:30AM to 7:30 PM and shows the impact Mother Nature can have on the ice floe on Hammond Pond. As you watch the video, pay close attention to the crack in the ice along the shoreline on the left. It’s amazing to see the impact wind has on the surface of the ice – something our eyes can’t perceive because it happens in slow motion. Condensing 11 hours of video into 3 1/2 minutes brings the ice floe to life. 2016 – The above is a time lapse video of clouds streaming over Hammond Pond in Goshen one day before the ice finally gave out and ended the 2016 Meltdown contest. That was the challenge that was issued. 1,752 tickets were sold. Steve and I went for a swim. 2015 – Here is a fish eye’s view of what the ice shelf looks like on Hammond Pond in Goshen on Sunday, March 15th, 2015. 2014 – I spent some time on the ice on Sunday with fellow Goshen firefighters Jake Lulek and Dan Daley. We drilled a few holes in the ice with an auger so I could measure its depth.